Zion Williamson started his Duke career with an unsustainable amount of hype. Already a YouTube and Instagram sensation for his high school mixtapes, Williamson was far and away the biggest star of Duke’s vaunted freshman class despite being ranked behind R.J. Barrett and Cam Reddish by most scouting services. There was no way he could live up to the otherworldly expectations placed on him. Except that he did and then some straight out of the gates against Kentucky in a 28-point effort that stands only second to Barrett’s 33 in the same game for the most points in a Blue Devil debut. He put on display the dominant inside presence that would come to define his remarkable freshman campaign and left the collective jaws of viewers on the floor in an overwhleming 118-84 win over the No. 2 Wildcats that set the bar for the season. And the dunks. Yes there were dunks. While Zion’s debut came on a neutral floor, he saved plenty of fuel for the Cameron faithful in Durham. He regularly wowed the home crowd with big games and bigger dunks in non-conference play and well into the ACC season. Perhaps no dunk in Cameron was bigger than the contest-worthy slam he delivered in an 87-68 win over Clemson. Williamson picked up one of his ACC-best 2.2 steals per game at half court and saw nothing but open floor between himself and the basket. He obliged an eager home crowd by uncorking this 360 tomahawk that makes a fine candidate for the dunk of the college basketball season. By the time arch nemesis UNC came to town, the Zion hype machine was in overdrive. Williamson had somehow surpassed the lofty expectations he arrived with in Durham, elevating his status as the hope upon which multiple tanking NBA teams had banked their futures. Zion’s presence in one of sports’ premier rivalries elevated normally must-see TV to a game that drew Super Bowl pricing in the secondary market and attracted a cadre of high-status fans that included former president Barack Obama. And then 36 seconds in, it happened — the shoe blowout heard round the sports world that left Duke faithful fretting over their title hopes and launched perhaps the fiercest debate of the sports year. Should Zion hang it up and protect himself for the NBA draft after suffering a knee sprain? Of course, we all know how that decision played out. By the time Williamson returned to the court against Syracuse in the ACC tournament, the landscape of college basketball had changed. Duke lost three of six games in Williamson’s absence, including a pair of losses to North Carolina. A one-point win at home over 26.5-point underdog Wake Forest blew the aura of invincibility away from Duke. Williamson did his best to restore that luster in a dominant effort against the Orange in the ACC quarterfinals. He scored Duke’s first bucket of the game before quickly assuaging any concerns over lingering knee issues with a steal and one-man break that ended with a thundering dunk. Duke looked far from invincible in the 84-72 win, but Williamson didn’t. His 13-for-13 effort from the field with 29 points, 14 rebounds, 5 steals and a block set a new ACC standard for makes without a miss in a single game. 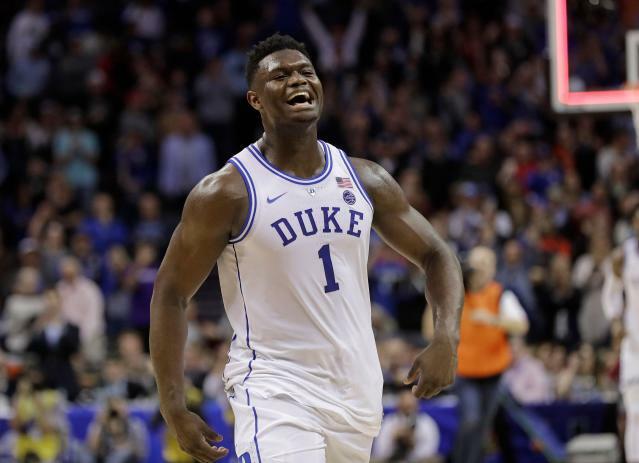 Duke’s win over Syracuse set up the matchup college basketball had been salivating for: Duke vs. UNC with a healthy Zion. It didn’t disappoint. Duke won a 74-73 thriller in the ACC semifinals that paved the path for the Blue Devils to win the ACC tournament and gain the NCAA tournament’s top seed. A Duke team that was outmatched in both regular-season losses to North Carolina needed everything it got from Williamson, including his go-ahead bucket in the game’s final moments. And, of course, Williamson now has his highlight-reel dunk against the Tar Heels for posterity. It’s up for debate whether Duke is still the juggernaut it looked like early in the season heading into the NCAA tournament. But there’s no doubt that it’s the favorite to cut down the nets in Minneapolis. And it’s because of Williamson’s return. Without Zion, Duke may have struggled to make the NCAA tournament’s second weekend. With him, the Blue Devils’ hopes of a national championship are restored.